They look like they're coming at me! As expected, when the new bees developed enough, they started washboarding. I wasn't quite prepared for how many of them there would be. Not only are there at least 60 on the doorstep, there are tons inside the hive, also exhibiting the same behavior. In fact, there are bees inside are just hanging off the comb, maybe they have recently emerged from their cells? There are so many bees at the entrance that the forager bees are having a hard time finding a spot to land. Quite often, they just land on the other bees. 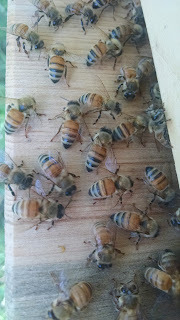 I guess in about a month I should expect to see a dramatic increase in honey production as these bees age? 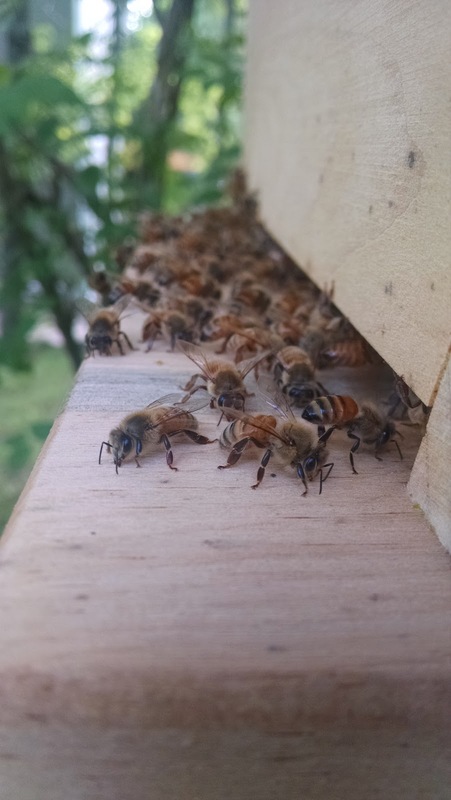 How do you distinguish "new" bees? Color? Washboarding? Juvenile appearance? The washboarding behavior is only done by bees that are at least 13 days old, according to research by the USDA. The peak of this activity is in the 15-25 day old range.